New York is synonymous to everything cool and awesome. Alicia Keys hit it right when she belted that it's a concrete jungle where dreams are made of. 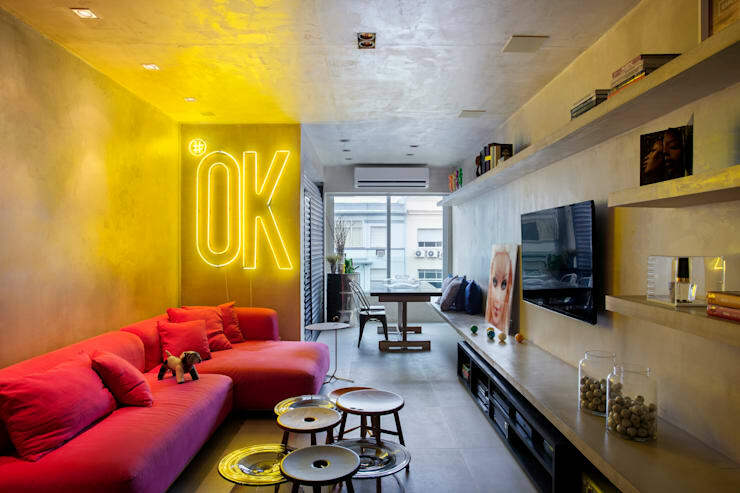 Be inspire by that line and translate it to your own place by taking a short trip around this apartment built by interior architects from Studio ro+ca in Brazil. Yes, it's small but it is big enough to let you cultivate your New York City dreams. 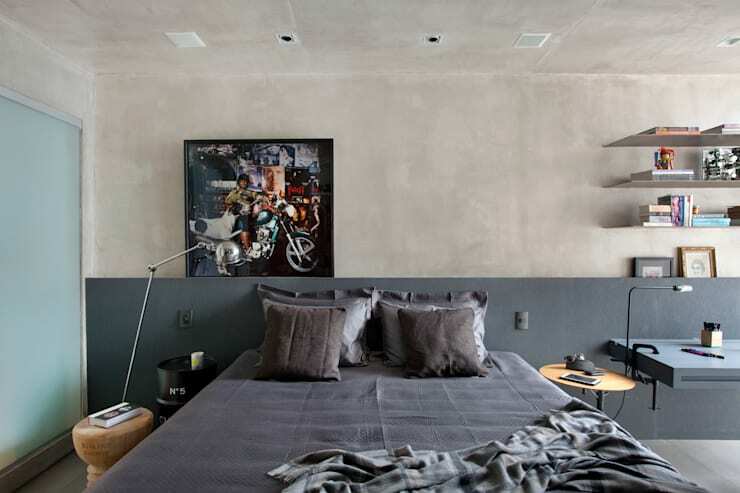 Invest in bringing hip to your place by sticking to smooth concrete for your walls, ceiling, and floor. The grey canvas will help you decide on what kind of cool you want to channel. This one is like a hipster's nest which mainly showcases a plush pink couch and an OK lighted sign. We like how the cement shelves here line the wall and serve to hold things that also decorate the interior. Stool chairs with the centerpiece ornaments also make an interesting coffee table alternative. Having a generic door is also too mainstream for this house so the more appropriate choice would be rummaging for metal shutters and painting them black. Of course, opening roller shutters would be so inconvenient so like any street smart hipster, installing doors is the best solution. This industrial entrance opens to the dining area that's well-lighted by the window. Keeping it New York, this kitchen is basically inspired by the yellow cab palette of yellow, black, and white. The neutral undertones of brown and grey also join the mix to achieve that sleek city vibe. Notice here the white tiled wall that reminds you of a fast food joint especially with the presence of that round windowed swing door. 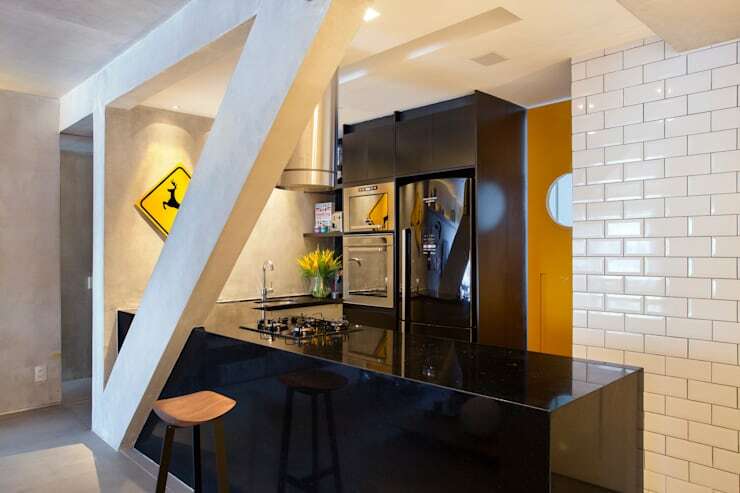 The slanting post by the kitchen counter also brings a modernist flare to the space. The cement surface apparently works well when it meets a rocky surface that's spotlighted from behind and below. It gives the house a luxurious feel to counter the otherwise too hipster vibe. No offense to hipsters out there—the wall says. Meanwhile, this view gives us the chance to see that the couch is elevated by a wooden platform that brilliantly serves to hold other pieces like a lamp and that framed art piece. The bedroom combines punk rock and industrial themes. It sticks to a grey, brown, and silver base palette to complement that framed piece. To save space, the shelves and desk here have also been mounted against the wall. The rest of the elements embody New York City atmosphere like the bedside lamp and that upcycled black barrel serving as an end table. 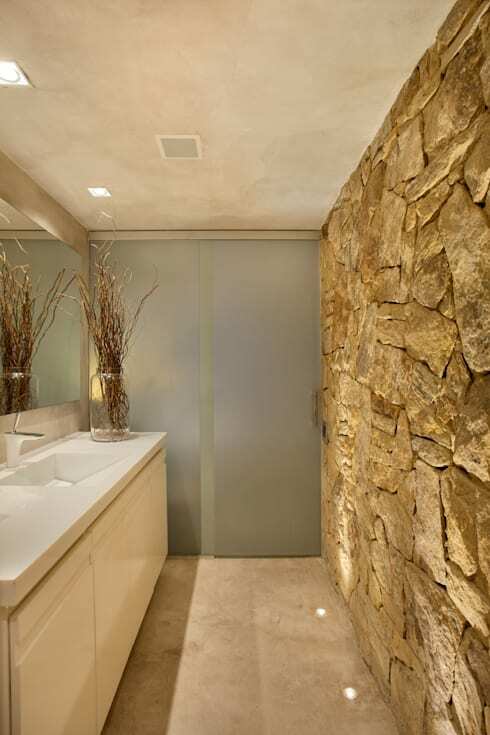 The bathroom is an unexpected but sophisticated part of the house because of its hotel-like lighting, stone wall, and minimalist design. 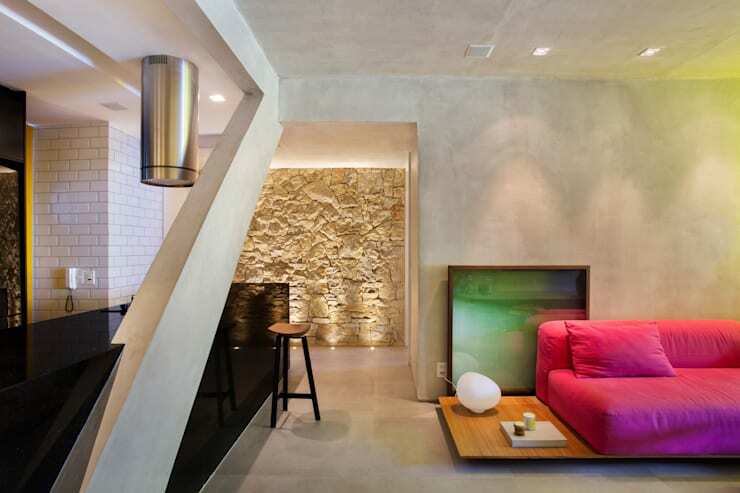 The door here sort of camouflages with the cement ceiling and floor which a nice way of downplaying the stone backdrop. On the other hand, the polished white sink and counter nicely complement the browns, greys, and yellows. We also like that dried stem bundle as a decorative piece in this area. 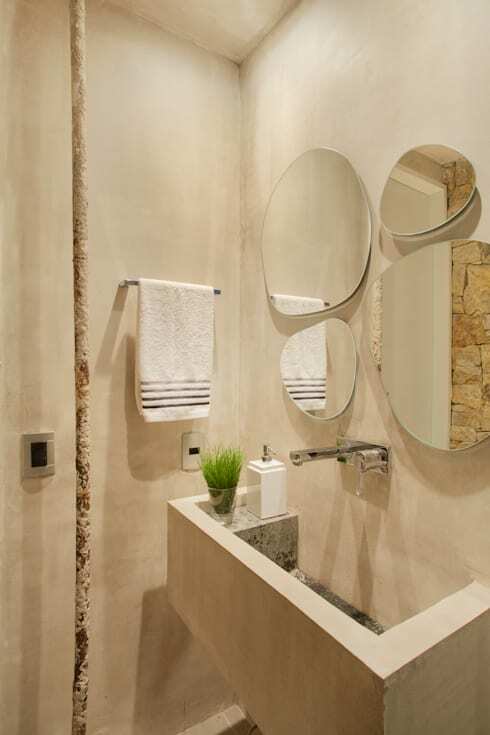 Another house comfort room features a deeper sink that's below an intriguing mirror. If you'd like to check out more bathroom ideas, see our professionals. If you're going for a more sophisticated design, see this small Korean flat transform into a Scandinavian-style dream home. We love this pad! How about you?